Although air temperature and relative humidity (RH) sensors provide the benefit of an economical means to collect measurement data for two parameters, there are some issues related to these sensors that you should be aware of. In this article, I’ll provide some background on air temp/RH sensors, discuss the tradeoff of going from all-analog to digital sensors, highlight issues related to the filter material, and offer some tips for selecting a sensor. Typically, we end up going back to EVERY manufacturer of air temp/RH sensors that we’ve worked with to help them improve their product so that it will work well in environmental applications. Even though these manufacturers may claim that their sensors are designed for environmental applications, their sensors were not specifically designed to be left outside, exposed to the elements, for long periods. We usually find one or more flaws that the manufacturers missed. This has been true even of high-end sensors. Fortunately, we have been able to work with manufacturers to address our concerns and make sensor improvements over time, as is the case with the HMP60. The HMP60 originally had a chrome-plated aluminum body. Over time the chrome plating would turn green and flake off. The problem was purely cosmetic, but it was a nuisance. Vaisala eventually changed the body to marine-grade 316L stainless steel. The body no longer turns green or flakes, and our customers are happy. Older, all-analog sensors, such as the HMP35C, had no analog-to-digital (A/D) conversion circuitry. These sensors were somewhat difficult to calibrate, but they performed really well and were very stable. All new air temp/RH sensors use some type of A/D conversion, which complicates matters when you use these new sensors with older data loggers that need an analog voltage output. This is because the sensor then must make an additional digital-to-analog (D/A) conversion. Thus, you must rely on the manufacturer to do several things: a great job of the initial A/D conversion, a great job of the D/A conversion so the data logger can read it, AND the performance of all of this over the temperature range of the sensor itself. This is where we have had the most issues with the newer all-digital air temp/RH sensors. Our experience has been that the manufacturer claims one thing, and we see something else or the sensor doesn’t hold its calibration over time when placed in the very real and messy analog world. By adding in the D/A conversion to get an analog voltage output, there’s one more uncertainty thrown into the mix. The benefit of digital sensors is that they’re usually very easy to calibrate. The “magic” is in the proprietary RH element and measurement algorithm used by the manufacturer. Most manufacturers are actually making a lot of really fast measurements in the background and outputting an average over time. Newer Campbell Scientific data loggers can read digital-output-type sensors just fine, but the programming can be tricky—except for SDI-12 output, which is what the CS215 uses. The advantage to reading a digital sensor directly is that it takes one step–the D/A process–out of the picture. We have had to integrate digital output sensors from several different manufacturers to our data loggers when required. The filter material used by most manufacturers passes water vapor very well, but the same is not true for temperature. If you’ve ever made very fast measurements using an air temp/RH sensor, you will notice the humidity changing much quicker than the temperature. It can take as long as 10 to 20 minutes for some sensors to equilibrate. This isn’t usually the fault of the sensor but the filter media. At very low wind speeds, the delay can be even longer. If condensation or water soaks the filter material, it will take time for the filter material to dry out. You will not know how long this process will take, as the process is highly dependent on wind speed and actual humidity of the surrounding environment. In the meantime, while you’re waiting for the filter material to dry out, the measurements are skewed. Filters are great at trapping pollutants and salts; however, depending on the filter material used, a microclimate can be created over time, which will skew the measurements. Microclimates may also be created by a dirty multi-plate or aspirated shield used around an air temp/RH sensor. You can expect to replace or clean the filter elements and shields on a frequent basis. Sensors will need to be visually inspected to determine how often this will need to be done. Condensation on the RH element will speed its degradation and drifting. This was a problem with older sensors. Some newer sensors that we’ve worked with use a proprietary coating on the RH element that protects it and increases the life of the element without degrading performance. An environment with consistently higher humidity, such as coastal or rain forest, will require the sensor to be calibrated or have its RH chip replaced on a more frequent interval. This could be as often as every six months to a year. More manufacturers have introduced heated temp/RH sensors to get around condensation issues. The idea is that a separate temperature probe measures air temperature while the RH element that has its own temperature sensor is kept at a specific temperature above dew point. The sensor takes the measured humidity value at its temperature and translates that value to the correct humidity for the air temperature value. These sensors require a bit more power to operate. Campbell Scientific does not presently carry a model of this type, but we have had to integrate them. The RH sensor material is sensitive to pollution. The type of pollution that degrades or destroys a particular RH sensing element is usually unique to the manufacturer. As a rule of thumb, petrochemical exposure is bad. Very few temp/RH sensors will survive well around a refinery. The same is true for ammonia (animal or human waste) and hydrogen sulfide or sulphur dioxide. You may notice that most of the issues listed above are not applicable for sensors used in an HVAC or environmental chamber environment. Deploying these sensors for extended periods in meteorological applications, however, is another story. This is why we try to be very thorough in the testing we do here and verify for ourselves the claims made by manufacturers. The following are some considerations when you are selecting an air temp/RH sensor. Lower-cost sensors will not have the resolution or accuracy of high-end sensors. 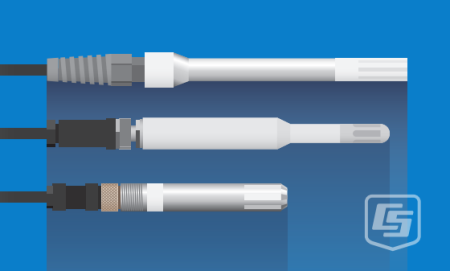 But usually the lower-cost sensors perform great in the field, don’t require calibration (the RH element is field-replaceable), and meet or exceed the accuracy and resolution that are required of them. What are the resolution and performance specifications? The truth is that making a relative humidity measurement is tough. Water in its vapor phase is a shifty molecule and completely non-linear in its behavior across temperature. Water’s behavior changes again when the temperature is below its freezing point. Every sensor on the market will have a tough challenge, with a corresponding high uncertainty, when trying to measure a 90% and greater humidity value. A tougher challenge is to measure relative humidity at below-freezing conditions. What accuracy do you really need? Go through the sensor’s specifications, and check the response time with the filter. Ask questions. Keep in mind that as soon as that sensor is put inside a naturally aspirated, multi-plate shield, the temperature specifications may have just been skewed. In direct sunlight on a warm day with very little wind, the temperature inside the shield could be anywhere from 0.5° to 1.5°C higher than the actual ambient temperature. How do you want to handle RH drifting? All capacitive-type RH chips will drift. Over time the RH element will craze (produce a network of surface cracks), and the RH will drift up and out of specification. Can you interrupt your measurement data collection to send your sensor in for calibration? You will have to do this for the higher-end sensors. In some cases, you can swap the head of the sensor out in the field with a calibrated one. Would you rather walk out to your site and replace the RH chip? You won’t ever be able to do this for high-end sensors. You just can’t get high-end performance out of a field-replaceable chip. Which data logger are you using? Always check the compatibility of the data logger that you would like to use with the sensor. For example, does the location for the sensor have consistently high humidity? Is there a lot of blowing dust? What about freezing rain, riming, or horizontal snow? It is important to understand the environment where the sensor will be located. High-humidity locations will require more frequent visits to either swap out the sensor or replace the RH chip, depending on sensor type. Blowing dust brings its own set of concerns. Dust accumulation on a fan-aspirated or multi-plate shield will skew the temperature on bright, sunny days. Dust will clog the filter material. The sensor measurements will be off after a multi-plate or fan-aspirated shield is covered with ice or packed with snow. At this point, the sensor is measuring the environment inside the shield and NOT the outside. Even with all the concerns of using a shield with the sensor, the shield still must be used. Outdoor applications require that the sensor be put into some type of shield to protect the sensor from direct solar thermal loading, direct rain/snow, and blowing debris. Use a shield if the sensor is used indoors in extremely dusty environments. The shield will provide some protection. Air temperature and RH sensors provide the benefit of obtaining measurement data for two parameters using a single sensor. The history and nature of these sensors, however, bring up issues that you should be aware of to ensure you are getting good measurement data. Selecting the sensor that will best meet your needs is also critical. I hope this article has provided you with helpful information for your measurement application. If you have any questions or comments about air temp/RH sensors, please post them below. Bart Nef is a Senior Support and Implementation Engineer at Campbell Scientific, Inc. He provides technical support for both new and old Campbell Scientific data loggers and instruments. Bart has a bachelor’s degree in electrical engineering and enjoys immensely playing with the gear at work. Glad you found the article helpful. "School of Hard Knocks" is a tough way to learn about things! Thumbs up. Although you did forget to mention horizontal, salt-laden freezing rain direct from Antarctica! The size and quality of the shield also makes a huge difference to us here in New Zealand and provides additional protection from the above. The RMY and RAD shields are both good. Would it be possible to get picture of these sites? What shields do you normally recommend? I really appreciate the comments. Keep 'em coming. So, for high humidity applications do you suggest proactively pulling the sensors annually to swap and calibarate? My stations are all in both high humidity and maritime climates as well as see light to moderate riming during the winter. Yikes! I'd definitely consider annual site visits to simply check the filter for salt contamination and do any necessary cleaning. Swapping them out is definitely a good idea. It's easier to work on 'em in the office and initially I'd send them in for calibration to see how far they've drifted. You might be surprised and discover you can go longer than once a year. I'm more concerned with riming tearing the shields and/or sensor filters apart. The digital air temperature sensors provide a much higher accuracy, allowing better reliability during crucial operations and circumstances. Digital air temperature sensors? I'd need to see specifications. In many cases I find that digital sensors are not much better, if not worse, then a precision thermistor or PRT. The problem I have with digital sensors is the conversion from A/D and then D/A. The dataloggers Campbell's builds are extremely precise, repeatable, and designed to run over a wide temperature range. I'd also need to know what you define as "crucial operations". We've got systems in the Sahara desert and Antarctica doing a wide variety of measurements that have run reliably and unattended using precision thermistors.